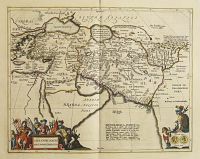 94 FADEN, W. European Dominions of the Ottomans, or Turkey in Europe. Londres, 1795. Limites en col. d'�poque. Infimes rousseurs. - Orig. outline colours. 550 x 730 mm. � Published by William Faden in London, August 12th 1795. 95 (TURQUIE). 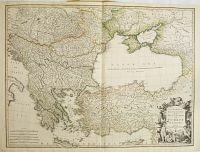 Turquie d'Europe / Turquie europ�enne / Turquie d'Europe et d'Asie. Paris, 1755 � 1828. Limites en col. d'�poque. Bon �tat g�n�raL In-folio � gr. 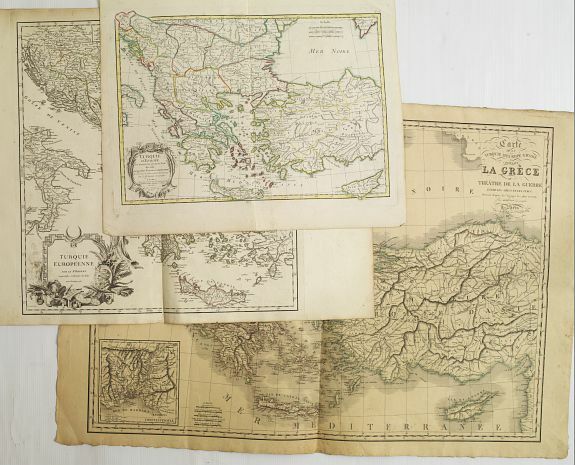 in-folio..
� Lot de 3 cartes par : Janvier, Vaugondy et H�risson. Avec l'�le de chypre sur les cartes de Janvier et H�risson. 96 TIRINUS, J. Chorographia Terrae Sanctae in Angustiorem Forman Redacta.. Anvers, 1632. Belle impression. P�le mouillure le long du pli central, marge inf. renmarg�e sur 9 cm. - Two sheets joined as issued. Slightly waterstaining along centerfold, 9 cm of low margin replaced. 325 x 820 mm. � Large map of the Holy Land surrounded with panels of vignettes displaying sacred objects including a menorah, the arc of the covenant, the altar of sacrifices, the Tabernacle, and a plan and elevations of the Temple. At center is an inset bird's-eye plan of ancient Jerusalem based on the Spanish biblical geographer, Juan Bautista Vilalpando. Oriented with east at top, the map includes the territories of the twelve tribes on both sides of the Jordan River and the route of the Exodus and Wandering. - Laor 771. 97 ADRICHOM, Ch. Van (d'apr�s). Situacion de la Tierra de Promision para la inteligencia de los Libros Sagrados segun la description de Christiano Adrichomio. Ca. 1800. 2 ff. jointes. Fortes mouillures, traces d'humidit� le long du pli central, plusieurs fentes le long de la pliure m�diane et 1 en haut de la pliure de droite, coin inf. gauche manquant restaur� avec du papier ancien. - Two sheets joined. Large water staining, a few tears along centerfold and traces of humidity in upper part of centerfold, lower left corner partly replaced with old paper. 350 x 1010 mm. 98 PROBST, J.-F. Ierusalem. Augsbourg, Haeres Ieremiae Wolff, ca.1730. Grav� en 2 ff. non jointes. Papier bruni, p�les rousseurs, traces de pliures horizontales et verticales, d�chirure consolid�e anciennement (sur 17 cm) � gauche en bordure de filet. - Printed from two plates, if joined : 302 x 1048mm. Paper slighty browned, minor spotting, marks of horizontal and vertical folds, old repair of split at left part near the neat line (17 cm). 302 x 1048 mm. � Imaginary view of ancient Jerusalem as seen from the east, after W. Hollar. Numbered key in both Latin and German (1-52). Sold as is. - Laor, E. 1111. 100 JANSSON, J. Alexandri Magni Macedonis Expeditio. Amsterdam, 1650. Beau col. ancien. Fente marginale en haut du pli m�dian. 365 x 465 mm. � Carte repr�sentant l'empire d'Alexandre le Grand. Beaux cartouches dans les coins inf. 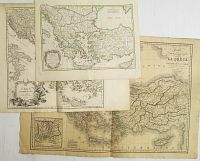 - A decorative thematic map illustrating the expedition to Macedonia by Alexander the Great. Decorative title cartouche at lower left surrounded by his soldiers and a portrait of the conqueror sitting above a drape displaying his medals at lower right. 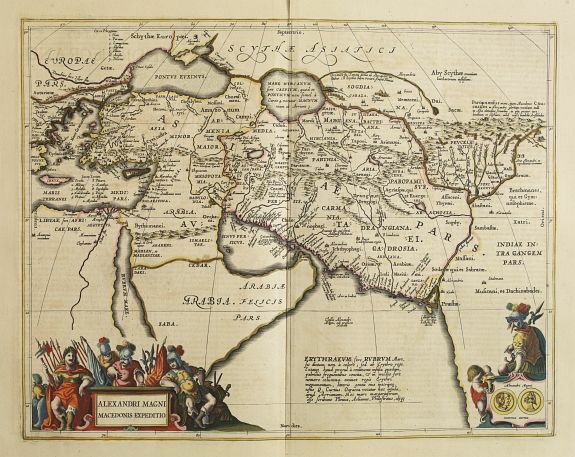 Including Turkey, Cyprus, the Arabian peninsular and Persia.